What the international phenomenon of The Rules did for conventional dating, The Rules for Online Dating does for the search for love on the Internet. You'll never hit the "reply" button the same way again. Millions of women around the world are meeting men on the Internet, or they've met in person and are corresponding by e-mail. But though e-mail and Net-based dating services have revolutionized the dating landscape, they've created their own pitfalls and challenges. Women need new strategies that will improve their chances of capturing Mr. Right. 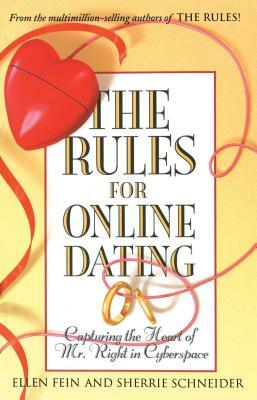 Boasting the same time-tested formula and romantic spirit that made The Rules an international bestseller and launched thousands of women down the path to committed relationships, The Rules for Online Dating shows all women -- regardless of age, status, or computer savvy -- how to use electronic communication to relate to men in a way that maintains self-esteem and leads to a healthy relationship. Here is a comprehensive list of dos and don'ts that will help every woman conduct an e-courtship safely and successfully; find and keep the interest of suitable mates; and save time, energy, and potential heartache by weeding out dead wood. The Rules for Online Dating takes women through the process -- step by step, Rule by Rule -- to the ultimate goal: a relationship based on mutual attraction, interest, and respect. Ellen Fein is a graduate of New York University and lives on Long Island, New York, with her husband and two children. Ever since she and Sherrie Schneider began weekly meetings in a Chinese restaurant years ago, lamenting their dating woes and discussing their friends' relationships, the two have been formulating and formatting their rules for dating that have now become so popular. They have come a long way, having been featured on Dateline NBC and the Today show, chronicled in People, Time, Newsweek, The New York Times, The Los Angeles Times, The Washington Post, and USA TODAY and even spoofed in a skit on Saturday Night Live. Since the success of the first book, there have been several spin-offs, adaptations, and parodies of The Rules, written by other authors, but none have garnered the attention of the original.